I got this too, but didn’t read it. I tossed it in the trash, and then got a bunch of letters demanding money for the DVD. I finally sent them a letter saying I never received it, and they stopped bugging me. I agree though, this is a crap. I got a couple of these. The second one I wrote return to sender and never even opened it. I haven’t gotten any more. REALLY. ANNOYING! It’s not legal. If they send it to you (without you placing an order for it or requesting it), it’s yours. Watch it, make a coaster out of it, whatever – you own it. It’s a very old scam that has been around for as long as there has been a Post Office. I like Dave Z’s reply. I’ll be applying that to all the unsolicited crap I get from now on. I will stop wasting my time returning something I didn’t order to the post office. 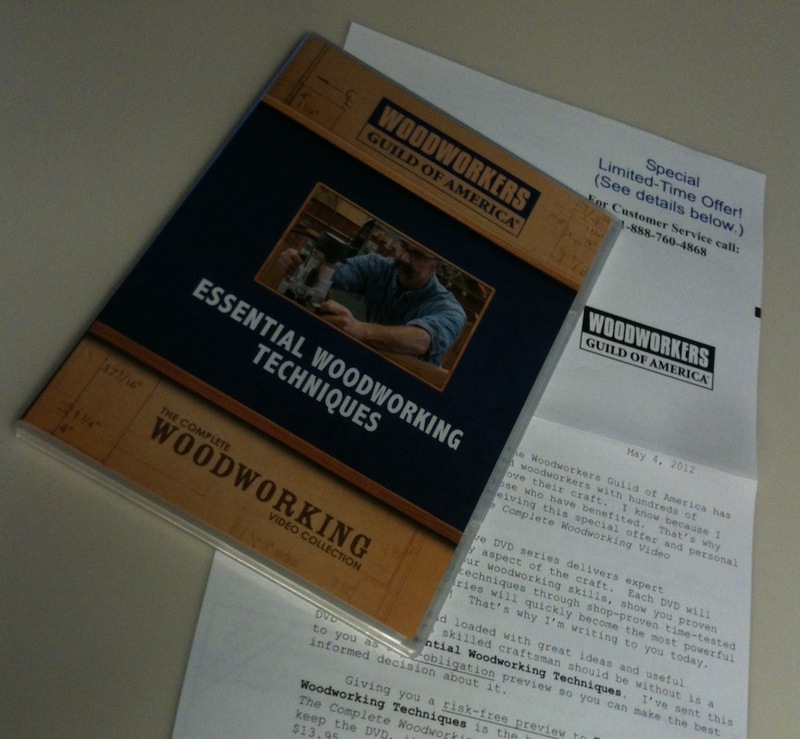 I was very disappointed in Fine Woodworking Magazine when they teamed up with this group! I almost canceled my subscription! I also checked with the USPS and Dave’s link is what I found. The good thing is, if you never send the DVD back they don’t send you DVDs anymore! I too received this DVD. It does say that you’re under no obligation to return it. I watched it and found it to be quite good, actually. Depending on how experienced you are, you might well find it too elementary, but for my (novice) level of expertise, it seemed quite good. I would have been tempted to order more if I wasn’t so put off by their marketing strategy. Maybe they’ve changed the wording, mine clearly side that if I didn’t return it then I was liable — which is illegal as it’s an unsolicited item. At that point it doesn’t matter how good it is. Just to clarify, although it does clearly say in one place that you’re under no obligation to return it, there are other things that they say that do imply that you need to return it if you don’t want it. Like most people, I realize that anything sent unsolicited does not need to be returned. And I agree, it doesn’t matter how good it is, when they use tactics like these. (And when they appear to be way overpriced, if a person does sign on to receive more.) It’s too bad, because, like I said, it seemed quite well done to me, and I would have been interested in receiving more had it not been for the marketing tactics and the price.